What is Moto G safe mode? Almost all Android devices offer a special mode called safe mode, which let you test the device with only pre-installed apps. Moto G (including Moto G 2nd Gen), Moto E (including Moto E 2nd Gen.) and Moto X (including Moto X 2nd Gen.) are not the exceptions. Essentially, Moto G safe mode (as well as Moto E safe mode and Moto X safe mode) can help you find out the possible cause of some phone problems due to third-party apps. As we mentioned in this guide, after any major update in your Moto G, you may want to clear cache partition if Moto G performs worse than before the update. But if the performance or weird problem is caused by some apps, clearing cache partition on Moto G will not help. You need boot your Moto G into Moto G safe mode. If the problem disappears, it means the problem is very likely caused by some apps you installed. Moto G safe mode will NOT tell you the culprits. Actually, as mentioned, all apps installed by you are temporally disabled by Moto G safe mode. If the problem persists, it means you may have to reset the phone or visit service center to check the phone. So, Moto G safe mode is needed only when you have some problems with the phone. Usually, you should try to clear cache partition before trying Moto G safe mode, when you have some problems with your Moto G.
How to reboot Moto G into Moto G safe mode? To reboot Moto G into Moto G safe mode, please follow these steps. Step 1: Get power options. Press and hold power button until you get the power options on the screen as shown below. The pop out window should appear in 2-3 seconds after you hold the power button. Please do NOT hold the power button too long. Moto G will simply reboot if you hold the power button too long (more than 5 or 7 seconds). Please note, the power options are different in KitKat and Lollipop. If you Moto G is still on KitKat, the sound mode (sound, vibrate and mute) option is available in the pop out window. As detailed in this page, you can use this option to quickly silence Moto G.
If you have updated Moto G to Lollipop, the sound mode option is no longer available here as shown below. You may read this page on the new notification and interruption system in Lollipop. You need tap and hold the option as shown below until it turns into Reboot to safe mode as shown below. If you just tap power off and releasing your finger, then your Moto G will be turned off. You need power it on and try again. 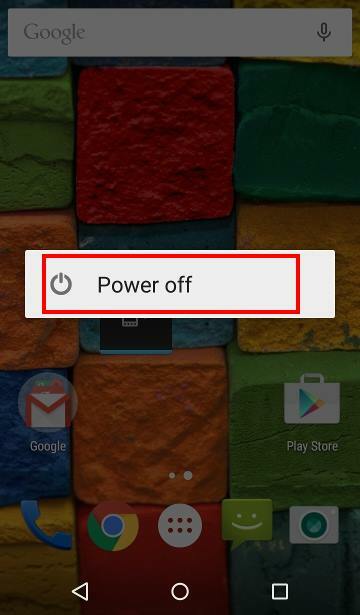 Power off option will turn into Moto G safe mode option after you tap and hold on it. Do you want to reboot into safe mode? This will disable all third-party applications you have installed. They will be restored when you reboot again. Tap OK as shown above to reboot Moto G into safe mode. Step 4: Check your Moto G in Moto G safe mode. After one or two mins, Moto G should be rebooted into safe mode. You can easily know the Moto G is in the safe mode from the watermark of Safe mode near bottom left as shown below. This Safe mode watermark appears on all pages and screens when the phone is in Moto G safe mode. 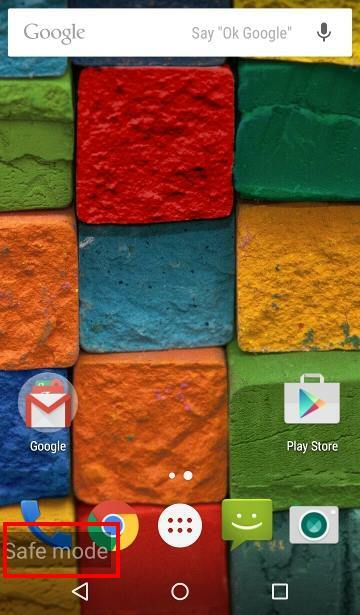 You may also notice some app shortcuts, app folders and widgets are removed from the home screen and apps screen. For example, as shown below, you can notice the Notification light widget was removed in safe mode. So, this is normal if you find some apps, widgets or app folders are missing in Moto G safe mode. You can test Moto G in the Moto G safe mode now to see whether the problem persists. How to exit Moto G safe mode? After testing Moto G in safe mode, you can simply press and hold the power button until it reboots. You can also use power options to power off Moto G, then power it on. In the notification panel, you also get a notification on Moto G safe mode, tap it may also guide you to exit safe mode (reboot the phone). How about Mot E safe mode and Moto X safe mode? You can reboot Moto E into Moto E safe mode, or Moto X into Moto X safe mode, in the exactly identical way as mentioned above. In other words, this guide applies to Moto E safe mode and Moto X safe mode equally. Can you use safe mode in Moto G, Moto X or Moto E? 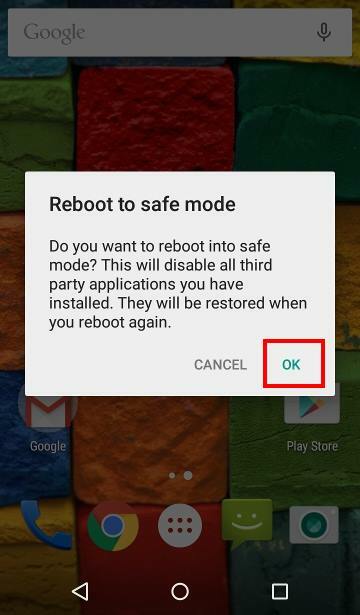 If you have any questions on how to reboot into safe mode in Moto G, Moto E and Moto X, please let us know in the comment box below. The community will try to help you find the solution. For Moto X owners , please check this Moto X how-to guides page. For Moto E owners , please check this Moto E how-to guides page. No, probably no other ways. If you know it is virus or malware, you should reset the phone immediately. Do not try to get any data from it. Next time, remember to back up, and to get apps from Play store only. Is there a way to power up a moto g phone into safe mode…. My phone is off and it stays on the logo screen or goes black, s anyway to fix this? If your Moto G cannot boot, you cannot enter safe mode. You may have to visit local Motorola service center. If you cannot see the dead Android, it means you have to visit service center. I have green a green box around stuff and it will not go away, it also will just vibrate. I cannot get it to do anything. HELP!!! Not sure what you are talking about. Please elaborate.